Volume 35 of the series offers chapters on theory and research, social cognition and social competence in children with Down Sydrome, the Flynn Effect and the role of IQ, remaining open to quantitative, qualitative and mixed-method designs, active support, child abuse, and the role of siblings of children with mental retardation. 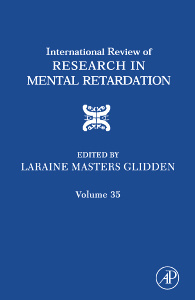 The wide range of topics covered in these chapters make Volume 35 of the International Review of Research in Mental Retardation a particularly valuable resource for academic researchers in developmental and cognitive psychology, as well as those in neuropsychology. Theory and Research on autism: Do We Need a New Approach to Thinking About and Studying This Disorder? Remaining Open to Quantitative, Qualitative and Mixed-Method Designs: An Unscientific Compromise, or Good Research Practice?